Please find below all relevant documents that you will need to fish for shellfish in our district. Please note: In a document pack sent out to stakeholders on the 15th September 2016 there was an error such that an incorrect version of the Byelaw was included. The incorrect version contained a 'deeming clause' which was not included in the final approved version text. 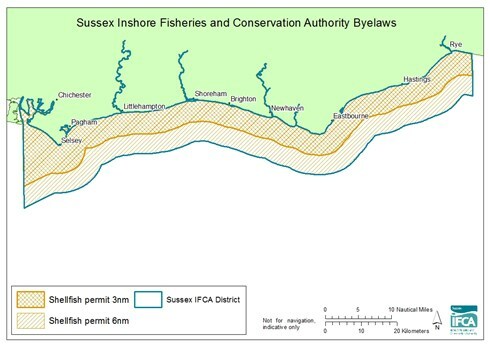 In the final version prohibitions relate to any fishing trip in which a vessel is used to fish within the District. The correct version was subsequently sent out on the 18th October 2016. The website version was correct at all times. Please refer to the website version of the Byelaw and the hard copies sent out by post in September 2016. Sussex IFCA apologise for any inconvenience caused. Please contact us if you have any questions.